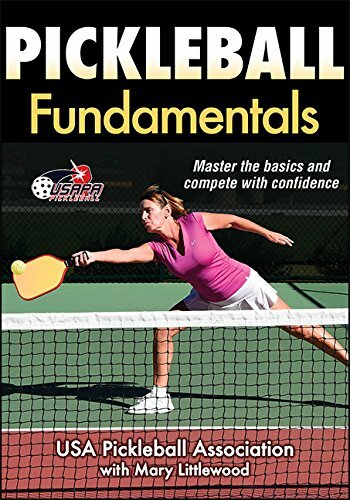 Pickleball Fundamentals is the first book written and endorsed by the USA Pickleball Association. It provides information on the basics of the sport to help prepare you to join the fun on the court right away. The book include over 40 drills and game activities to keep you engaged and interested while improving performance as well as competitive tactics for various scenarios and strategies for both singles and doubles play. Pickleball is a simple paddle game, playing a special perforated slow-moving ball over a tennis type net, on a badminton-sized court. The ball is served underhand, without bouncing it from the court, and is served diagonally to the opponent’s service zone. Pickleball Rules staet points are scored by the serving side only and occur when the opponent faults (fails to return the ball, hits the ball out of bounds, etc.). The server continues to serve, altering service courts, until the server faults. A game is won by the first side to reach eleven (11) points but will continue until won by a two point margin. Click here to see our Pickleball Court Dimensions page for a layout diagram. Also be sure to check out how inexpensive it can be to establish your own Pickleball League right in your own driveway at Amazon.com! Serve Position: Server can have one foot inside the baseline, as long as the other foot is outside at moment of serve. Service Bounce Rule: Following serve, each side must make at least one ground-stroke, prior to volleying the ball (hitting it before it has bounced). Non-volley Zone: A player cannot volley a ball while standing within the non-volley zone.